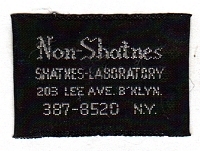 Authority: Lee Avenue Shatnez Laboratory, Brooklyn, New York, U.S.A. Comment: The label is usually sewn into a garment which has been found to be free of sha'atnez, i.e. the proscribed mixture of linen and wool in the same garment.